An awesome neighbor spearheaded an informal July 4th block party yesterday, and Susan and I were one of a bunch of residents who participated. Susan made a cheesecake to share with anyone who dropped by to say hey, and I had semi-grand plans of displaying some of the finds that I’ve dug up over the years and accumulated together as my Museum of Backyarchaeology. Of all the strange things that I’ve dug up out back over the years, this duo yields perhaps the greatest intrigue. What happened that necessitated the gun being fired, to whom or what might the bullet have been meant… and if so was it a shot that found its target? Kinda creepy. So here’s hoping that target was simply a tree or a bottle and the shot was fired neither in anger nor defense, but perhaps in practice. 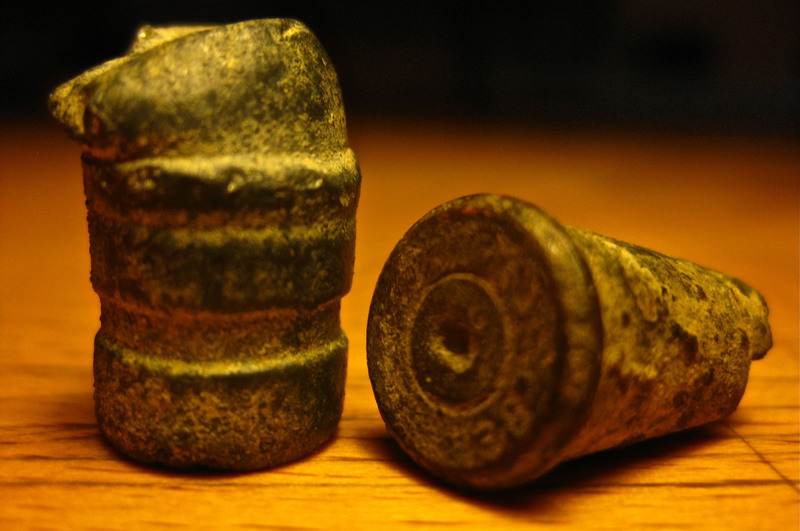 Assuming that the casing and bullet once were one, the brittleness of the brass seems to indicate they were divorced of each other many, many years ago. This entry was posted on Thursday, July 5th, 2012 at 12:16 pm and is filed under backyarchaeology. You can follow any responses to this entry through the RSS 2.0 feed. Both comments and pings are currently closed.